July 14, 2017 -- Wendy Hartley has her son’s last heartbeats tattooed on her chest. She asked the doctors to print out a tracing of them after they turned off his life support. “I told them, ‘I carried his first heartbeat, I’ll carry his last,’” she said, tears slipping down her cheeks. Kevin Hartley was working for his family’s business when he collapsed while refinishing a bathtub at a Nashville apartment complex in April. When his father and brother couldn’t get him on the phone, they went to check on him and found him slumped over the side of the tub. They quickly pulled him out of the bathroom and into fresh air. His brother performed CPR until paramedics arrived. At the hospital, a doctor told Wendy that fumes from a chemical he’d been working with had caused Kevin’s heart to stop. Though they had been able to restart it with machines, they could not find any brain activity. He had simply gone without oxygen for too long. 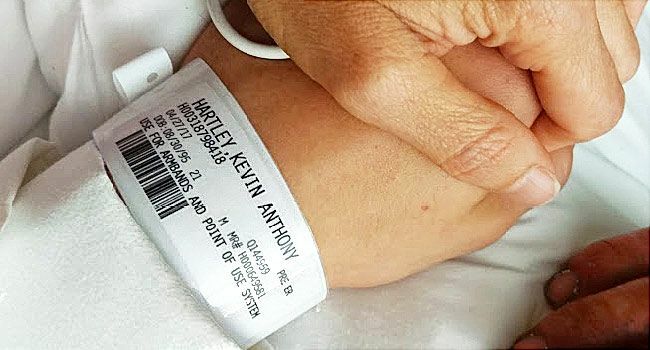 The Hartleys kept Kevin alive long enough to fulfil his wish to be an organ donor and to give his sister, a nurse and captain in the Army, time to travel from Alaska to say goodbye. They clipped curls of his hair and made plaster impressions of his hardworking hands. His grandmother, who is also a nurse, found Wendy a stethoscope so she could hear his heartbeat. The 21-year-old former football player was declared brain dead at 4:52 p.m. on Friday, April 28. Kevin was working with a chemical called methylene chloride. Doctors have known it can kill for more than 50 years. The European Union banned most consumer and professional uses of the chemical in 2011. Despite its dangers, it’s not hard to get in this country. Home improvement stores sell it by the gallon to do-it-yourselfers who want to refinish furniture or remove old paint. Until this year, the only warning required on the labels of products that contain it was about its long-term cancer risks. But it can also kill suddenly. In the body, methylene chloride turns into carbon monoxide, which crowds out oxygen in the blood. Without substantial protective gear, it can quickly starve the heart and brain of air. People have passed out in as little as 5 minutes of exposure, according to reports from the Occupational Safety and Health Administration (OSHA). As little as 6 ounces can be deadly. The Environmental Protection Agency (EPA) has wanted to ban the chemical for years, but getting chemicals off the market has been a legally burdensome process. Last year, Congress passed a new law that was supposed to make the process easier. In January, the EPA proposed its long-awaited ban on methylene chloride as a paint and coating stripper, just 3 months before Kevin died. But the federal government’s rulemaking process always takes time. And amid chemical industry maneuvering and leadership changes at the EPA under the administration of President Donald Trump, the effort to get methylene chloride off the market seems to have stalled. Environmental advocates are watching to see if last year’s reforms, which were meant to give the agency more authority to regulate toxic chemicals, will have any teeth. “Now it’s kind of a waiting game, and to be honest, we’re very concerned that [this ban is not] going to be finalized,” says Lindsay McCormick, a project manager for the Environmental Defense Fund. “Will it end up being a ban? Or is it going to be scaled back?” McCormick says. The EPA estimates that about 1.3 million consumers use products containing methylene chloride each year. Another 32,000 workers use it on the job, as Kevin did. OSHA says 17 workers have died from breathing methylene chloride between 2000 and 2015. The agency is still investigating what happened to Kevin Hartley, but a medical examiner was clear: Kevin died because of methylene chloride. In a separate investigation, journalists with the nonprofit, nonpartisan Center for Public Integrity found at least 56 professionals and do-it-yourselfers have died suddenly after inhaling it since 1980. And those are just the deaths we know about. OSHA doesn’t regulate self-employed workers or independent contractors, and it may not always be apparent that methylene chloride is a reason when people collapse at home. Some experts suspect methylene chloride deaths are undercounted because of that. OSHA considers every death from methylene chloride to be preventable. Since graduating from high school, Kevin had worked at several entry-level jobs, but he couldn’t seem to advance or get promoted. He tried applying for college, but a mix-up with his transcripts left him frustrated and sent him seeking other opportunities. He was good with his hands. He understood machines, and he liked working on cars. He rebuilt carburetors for a while, but the company he was working for told him he was doing it too fast. They ran out of work for him. In bathtub refinishing, Kevin saw an occupation that would finally allow him to make a good living. In October, he traveled to Chicago to take a 2-day class offered by a chemical company called NAPCO Ltd. It cost $595 and promised a “GREAT CAREER for men and women,” according to the company’s marketing materials. A telephone message says some bathtub refinishers can make six-figure incomes. A spokesperson for the company confirms that Kevin and his uncle attended their refinishing class, and says their training emphasizes the use of proper safety equipment and precautions. The company says Kevin was using a product called White Lightning Low Odor Stripper and confirms it contains methylene chloride. They also say they are cooperating with OSHA in its investigation of Kevin’s death. Kevin went home ready to work, but without all of the recommended safety equipment -- a decision that might have cost him his life. He went to work for his uncle’s company almost as soon as he got home. They had recently signed a contract to spruce up rentals for Nashboro Village, a sprawling, five-property complex on Nashville’s southeastern outskirts. Kevin’s job was to refinish the countertops and bathtubs. Methylene chloride is particularly deadly to bathtub refinishers. Because its vapors are heavier than air, it sinks and builds up in the basin of the tub, right where a refinisher has his head while working. “It’s a tough job, like scraping bark off a tree,” says Gary Goel, who runs the Professional Bathtub Refinishers Association in San Antonio. Chemical strippers like methylene chloride soften the paint, which is tightly bonded to the tub’s surface. Razor blades finish the job. Fifteen years ago, Goel was called to a local hotel, where he found a bathtub that was halfway stripped. Goel himself has been in distress when stripping a bathtub. He was wearing a kind of mask that’s commonly used in the trade. Kevin Hartley still had his on when they dragged him from the tub. It covers the mouth and nose and has two canisters, one on each side of the face. The canisters hold filters that screen out some kinds of fumes. Within a short period of time these kinds of filters can fail, though, allowing methylene chloride vapors to sneak through. Goel’s mask also had a tiny crack in it that he couldn’t see. Refinishers often don’t realize they are in trouble until it’s too late, Hall says. “I remember, you start kind of hearing Charlie Brown’s teacher talk to you in your ears. That ‘wha-wha-wha’ sound,” Goel says. It also irritates the mucous membranes. Goel says he started drooling heavily, which is what finally forced him to stop. He was about to tell one of his friends to drive him to the hospital when his symptoms started to clear. OSHA regulations require workers who work in heavy concentrations of methylene chloride vapors, as bathtub refinishers do, to use a system that pumps fresh air into a mask that covers the entire face, nose, mouth, and eyes. It looks like a hazmat suit with a long hose that runs to outdoor air. A spokesperson for NAPCO Ltd. says Kevin and his uncle declined to purchase the company’s fresh-air system, which costs $429. That’s about as much as a refinisher makes on a single job. Goel says he sees that a lot. Goel says when he sees that happen, he will sometimes give them the mask free. “I think there’s a whole lot of ‘It’ll never happen to me,’” Goel says. And a lot of bathtub refinishers aren’t formally trained, Goel says. They’ve picked up the trade by watching someone else. He says many simply don’t know how dangerous the strippers can be. Goel says guys who work in apartments, as Kevin did, depend on the chemical’s speed. “They work on volume. These guys are running from apartment to apartment. It’s hard to be mobile with all the safety equipment,” he says. Less toxic strippers are available but take longer to work. Many require a day to sit and cure. Goel says that can feel like too long when time is money. Despite everything he knows, Goel doesn’t think methylene chloride should be banned. The EPA has long had methylene chloride on a list of dangerous chemicals it would like to more closely regulate. But a 1976 law, the Toxic Substances Control Act, made it extremely difficult. Under the law, the EPA had to not only prove health risks, but also consider the economic consequences of taking a chemical off the market. Over the years, the agency has successfully banned only five chemicals -- out of an estimated 80,000 in use. Asbestos became the poster child for this weakness in the law. Asbestos is an undisputed cause of cancer. In the 1980s, the EPA spent 10 years and $10 million trying to get it off the market. But in 1991, a judge overturned the agency’s ban, saying that regulators hadn’t fully considered the economic ramifications. The agency hasn’t attempted to take another chemical off the market since that decision. Under a bipartisan law passed in June 2016, Congress for the first time gave the EPA authority to regulate chemicals solely based on their health risks. The new law also gave the agency the green light to act quickly on chemicals it had already flagged as high priorities. Methylene chloride was on that list. Barely a month after the new chemical reforms were passed, the chemical industry moved to counter it. Caffey Norman, a partner at a firm that’s lobbying on behalf of the solvents industry, filed a petition with the federal Consumer Product Safety Commission (CPSC) on behalf of the Halogenated Solvents Industry Alliance, the trade group that represents manufacturers of methylene chloride. The petition asked the commission to beef up the warning labels required on products that contain methylene chloride. Instead of just talking about the long-term cancer risks, they said, the label should include more information about the risks of sudden death. After declining to take action last year, the commission unanimously agreed to the changes in June. The new labels will also include a graphic to indicate that the products should not be used to refinish bathtubs. The petition wasn’t just filed to encourage safer use of the products. Norman, a partner at Squire Patton Boggs, says it was also a legal strategy. Under the new reforms, if a chemical is already regulated by another federal agency, the EPA can’t also regulate it. That means the EPA might not be able to move forward with a ban. “We don’t think the proposed rule will become final,” Norman says. “If EPA were to proceed and adopt a ban, we would be able to argue that this fell into CPSC’s jurisdiction, and CPSC is in the process of acting." Norman adds all the companies that make products with methylene chloride also make other kinds of paint strippers, too. So it’s not as if a ban would take all their products off the market. “The reason they’re all fighting to defend methylene chloride is that because when they sell people the other stuff, they bring it back to the store and tell them it didn’t work. They go home with some methylene chloride-based paint stripper, which does work. It’s as simple as that,” he says. The only federal rules that govern the use of methylene chloride protect people who use it at work. The rules, passed in 1997, say that workers shouldn’t be exposed to more than 25 parts per million (ppm) of methylene chloride. Before the OSHA rules took effect, the average methylene chloride concentration that workers were exposed to was 85 ppm in the air they were breathing. Since 1997, it has dropped only slightly to 72 ppm, still far above the government standard. “I basically wrote that rule, and it’s not what I’d hoped,” says Adam Finkel, ScD. He’s now a professor of environmental health at the University of Michigan School of Public Health, but he once worked for OSHA, where he played a big role in developing the first safety standards for methylene chloride. Finkel submitted an analysis to the EPA that looked at whether the OSHA rules had reduced the average levels of methylene chloride that workers were exposed to. His analysis was based on government data he obtained through a federal Freedom of Information Act lawsuit. Finkel says there are still widespread and flagrant violations of the OSHA standard, but he says the agency rarely catches them because its inspections are geared more toward spotting safety hazards, not to health. “This is a chemical that’s heavily used in very dispersed, very small shops. OSHA’s not going to be able to inspect bathtub refinishing. It’s just impossible to go to somebody’s home,” he says. He says that given how hard it is to get people to take adequate safety measures, the EPA needs to get methylene chloride off the market. Finkel also rejects the argument that methylene chloride is the only stripper on the market that works. Sitting in a booth at a Panera Bread on the outskirts of Nashville, Wendy Hartley laughs as she talks about her son. She laughs about the goofy names of Kevin’s pets: Batman, a cat, and Chevelle, a golden retriever. She laughs when she says the only furniture in his apartment, his first place on his own, was a dining room table, a mattress, and a TV. Wendy doesn’t remember Kevin ever saying he was worried about the chemicals he was working with, but after a few months on the job, it became apparent to his family that he didn’t fully understand what he was dealing with. Even if Kevin was wearing gloves, he might not have known that many kinds, including the less expensive latex and rubber ones sold at home improvement stores, don’t protect skin from the caustic chemical. “We think when he passed out he fell into the tub and into the chemicals and just stayed into the chemicals,” Steve says. At the hospital, in the waning hours of her son’s life, his mother watched second and third degree burns bloom over Kevin’s right hand and arm. His grandmother, Kathy Davis, tracked down a nurse and asked for bandages. Wendy keeps her youngest son close to her in small ways. She uses his cobalt blue utility knife during the day at her job at a local airfreight company. She keeps Kevin’s wallet in her purse. Some of his ashes are in a heart-shaped locket that hangs around her neck. She has written letters to the people who got Kevin’s organs. In a year, if the recipients agree, she can meet with the people whose lives he saved. Two men, both fathers, got kidneys. A male in his 40s got his lungs. A female nurse got his heart. “There is a chance that I’ll get to hear his heart beating again. That helps,” she says. Wendy doesn’t know much about the EPA’s efforts to regulate methylene chloride or the industry’s efforts to curb it. Political wrangling in Washington feels pretty far removed from her life and the fresh pain that’s now in it. But the question of what should happen to methylene chloride seems like it should have an obvious answer. Wendy Hartley, Kevin’s mother, Nashville, TN. Steve, Kevin’s stepfather, Nashville, TN. Lindsay McCormick, a project manager, Environmental Defense Fund. Gary Goel, Professional Bathtub Refinishers Association, San Antonio. Adam Finkel, ScD, clinical professor of environmental health sciences, University of Michigan, Ann Arbor. Ronald Hall, industrial hygienist, National Institute for Occupational Safety and Health. Caffey Norman, partner, Squire Patton Boggs, Washington, D.C.
Environmental Protection Agency: “Regulation of Certain Uses under the Toxic Substances Control Act: Methylene Chloride and N-Methylpyrrolidone." Center for Public Integrity: “Unequal Risk: Common Solvent Keeps Killing Workers, Consumers." Occupational Safety and Health Administration: "Methylene Chloride Standards," “Fatal Facts: Lethal Exposure to Methylene Chloride during Bathtub Refinishing."